Suffolk County's more obscure elected positions continue to prove popular among retired or ousted city councilors. 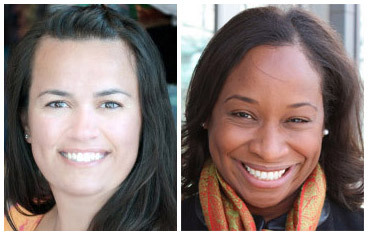 The Globe reports that City Councilors Charles Yancey and Steve Murphy, who lost their elections in the fall, are both eyeing the for-some-reason-still-elected position of Suffolk County Register of Deeds. This morning, a roving UHub reporter spotted Yancey in the register's office: Read more. 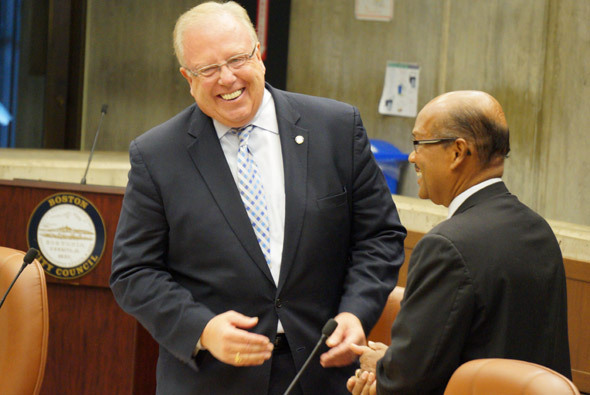 Boston city councilors and Mayor Walsh said goodbye to councilors Charles Yancey (Dorchester) and Steve Murphy (at large) at their final meeting of the city council. Walsh presented the two with Revere bowls for their years of service - 32 for Yancey, 19 for Murphy. Read more. City councilors Steve Murphy (at large) and Charles Yancey (Dorchester, Mattapan), both of whom lost in yesterday's election, share a moment before this afternoon's city-council meeting. City councilors are working with residents along American Legion Highway to preserve "urban wilds" along the road and ultimately create a more bucolic stretch out of what at-large Councilor Steve Murphy says is now a "blighted" area. Read more. Councilor Charles Yancey (Dorchester) today proposed installing WiFi systems in BHA senior and family housing buildings to provide free Internet access to residents. Yancey said Internet access is vital in today's world, but that residents of housing projects often cannot afford to connect. Several years ago, then Councilor John Tobin proposed a citywide WiFi network. Mayor Menino Wified the idea, which ultimately went nowhere. Councilor Tito Jackson praised Yancey's idea as "a no brainer." The Globe reports on a forum for the districts now represented by Charles Yancey and Tito Jackson - the only ones to have enough candidates to require preliminaries on Tuesday. Perennial candidate Roy Owens, this time running for Jackson's seat, demanded the city stop asking churches to close on Sunday for "rock and roll." City Councilor Matt O'Malley (Jamaica Plain, West Roxbury) says Comcast just isn't cutting it for Boston and wants to look into ways to get Verizon to bring its fiber-optic connections into town - or other companies or utilities that might do so. RCN isn't really competition enough for Comcast and with FiOS stopping at the city line, Boston is in danger of falling on the wrong side of the digital divide for a lack of competition, O'Malley said at a City Council meeting today. Read more. The Dorchester Reporter takes a look at the race for city council in the Fourth District, where incumbent Charles Yancey - who begins pretty much every public statement by declaring he's the longest serving city councilor - faces three opponents in the September primary. Here in the UHub newsroom, of course, we can hardly wait. Maybe he'll also explain why he suddenly dropped his 20-year campaign for a high school in Mattapan when he finally had at least a 9-4 majority on the council last fall. The City Council today agreed to let Councilor Charles Yancey (Dorchester) hold a series of hearings at which state and city officials can explain how replacing the Casey Overpass with a series of surface roads won't give residents cancer or block ambulances from getting heart-attack and stroke victims to the medical area - but not demand the work be stopped altogether. Or, at least, that's what Yancey professed today. "This is not [a motion] to cease and desist the demolition of the Casey Overpass," Yancey told fellow councilors. City Councilor Charles Yancey (Dorchester) wonders if the project to replace the Casey Overpass with surface roads will cause problems for people heading to lifesaving medical treatment in the Longwood Medical Area or to soul-saving worship services at area churches, so he's seeking "a series of hearings" on the demolition plans - three years after state officials announced the plans. City Councilor Charles Yancey (Dorchester) today will propose ordinances to require all BPS school buses that can carry 35 or more students to be equipped with passenger seat belts and to carry a monitor to keep them from getting out of line. The council will take up the proposals at its regular meeting, which starts at noon in its fifth-floor chambers in City Hall. 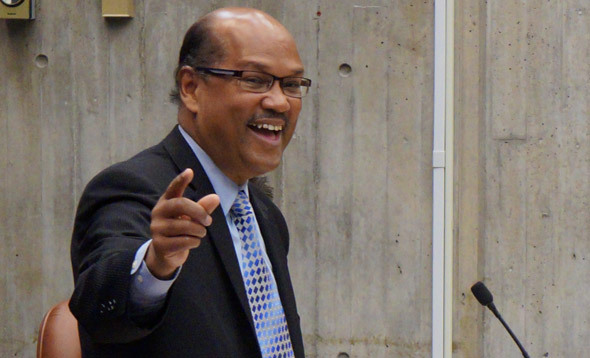 For the second straight meeting, the City Council agreed to delay a vote on Councilor Charles Yancey's proposal for a $120 million high school in Mattapan. The council approved borrowing for the high school last month, but the measure needs two positive votes before it can go to the mayor for his consideration. File a report each year stating the race, gender, number and percentage of Boston workers employed at each level of the company’s operation as well as the racial and gender composition of the Boston workers at each level of the company’s operations. The City Council today was about to vote for the second time on Councilor Charles Yancey's proposal to borrow $120 million to build a new high school in Mattapan - which would have sent the matter to Mayor Walsh - when Yancey asked for the vote to be delayed for two weeks.